I was born in Ceres, Western Cape and ended in Paarl via Robben Island, Zonderwater, Standerton and Riebeek West. I matriculated at Paarl Boys High and then started my National Service. I was fortunate enough to do an officer’s course at the age of 19 and lead a platoon of soldiers on the border. 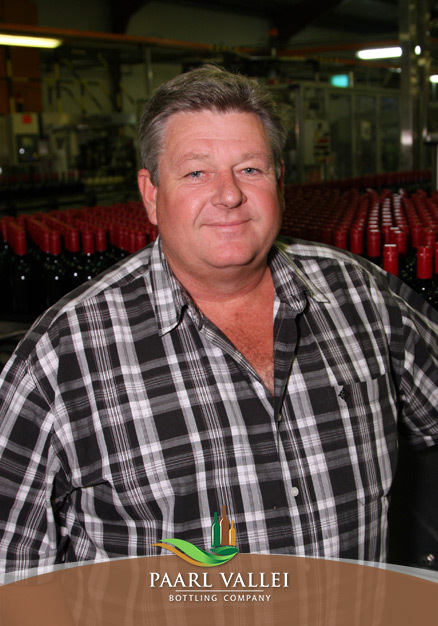 I started my career as an Assistant Bottling Line Foreman at Stellenbosch Farmers Winery (Monis) in Paarl where I then climbed the ranks from Spirits Blender, Spirits Production Manager, Bottling Manager, Production Manager to General Manager in 1993. In this process I had a few fantastic mentors (like Brian Haynes, Jack Haynes, Carlo Raffi and Hans Losch). 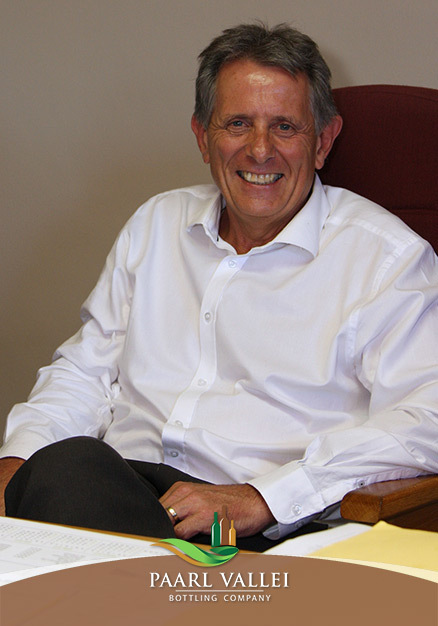 I joined Paarl Valley Bottling Company in 2003 as General Manager and become Managing Director in 2006. I was born in Kakamas, Northern Cape and matriculated at De Rust, Klein-Karoo. I completed my B.Econ degree at the University of Stellenbosch. I started my career working at Volkskas Bank, Oudshoorn and after completing my two years military service I returned to work at for Volkskas and formed part of a team implementing new banking systems over the next three years in the Western, Central and Southern Cape Provinces. My career path then took me to the wheat fields. I completed a Management Development Program and a diploma in Small Business Management through UNISA while I worked as Accountant at “Moorreesburg Koringboere Koöperasie”. 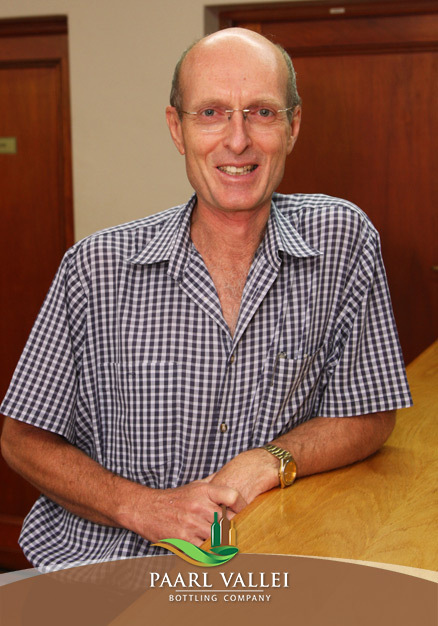 I joined Paarl Valley Bottling Company in 1999 as Financial Manager. My love for numbers and agriculture was set during my childhood years in Onseepkans, Northern Cape. Life Philosophy: Always be prepared to grab opportunities before it passes by. I was born and grew up in citrus country, Sunday River Valley in the Eastern Cape. My family moved to the Western Cape during my teenage years and I matriculated at Kuilsriver High. I Completed my BSc degree at University of Stellenbosch and started my career at Distillers Company (now part of Distell) as a Senior Laboratory Analyst, a complete novice in the wine industry with no knowledge whatsoever of wine, or the winemaking process. My years at Distillers formed the basis of my wine knowledge. Before I left the company I had a few months experience as Quality Manager. My appointment as Quality Manager at Paarl Valley Bottling in 1996 really introduced me to the whole spectrum of the wine industry and its people. I started with a basic management role at Paarl Valley Bottling while also managing the lab, but grew with the company. Now I am responsible for Food Safety, Quality and other related systems. I still oversee running the Laboratory, Quality Control and Cellar functions. I was born in Cape Town and matriculated at Tygerberg High. I started work as a clerk at Sanlam and then completed my ND Analytical Chemistry Diploma at Cape Technicon. I started my career as a chemist at Sonchem, where I worked for 12 years. 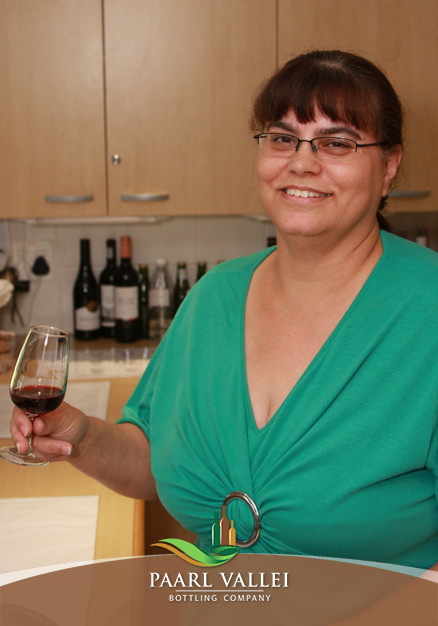 I entered the wine industry in 2000 as Lab Analyst at KWV and then moved to Paarl Valley Bottling where I started as Lab Analyst, became Head of Laboratory and then changed my career path to my current position as Planning Manager. My life philosophy: “If you don’t have time to do it right, when will you have time to do it over? I was born in Robertson, matriculated at Bellville High and completed a Fitter and Turner N2 course at Westlake College. My career started from being an Artisan to an Artisan Supervisor and then a Line Manager Technician. My career in the wine industry started at Nederburg Wines and Stellenbosch Farmers Winery (now Distell). 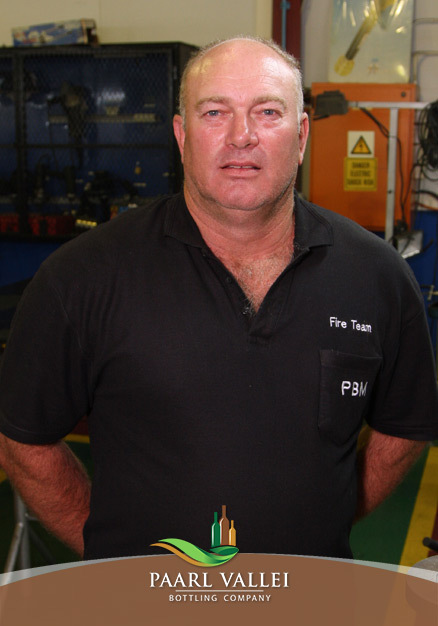 I entered my current position as Maintenance Manager at Paarl Valley Bottling Company in 2001. I have a passion for production, production equipment and the wine industry. I was born in Port Elizabeth and grew up in Oudshoorn where I matriculated at HTS. I then completed Dairy Academy 1&2 at Elsenberg (University Of Stellenbosch). Later I also completed a store and pack house course at CPUT. My career started in 1993 at Towerkop, Parmalat as a butter maker. I then joined the logistics department, by managing freezer and cooling stores stock. Later I was promoted to Assistant Buyer for two sites in Oudshoorn. 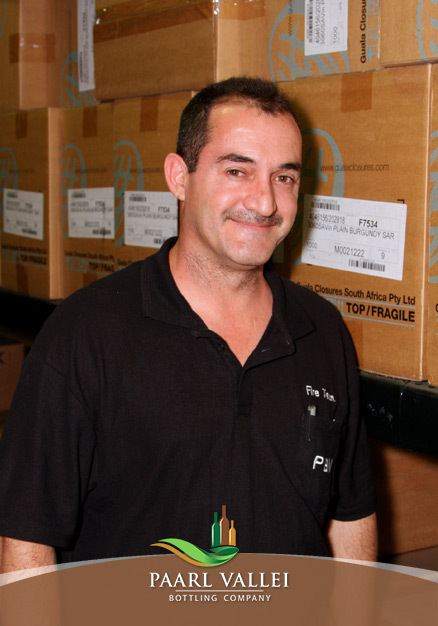 My career in the wine industry started at Paarl Valley Bottling as Pack house Store Manager in April 2002. After 11 months I was appointed Head of the Dry Goods Store and from 2004 I was appointed as Dry Goods Store Manager. 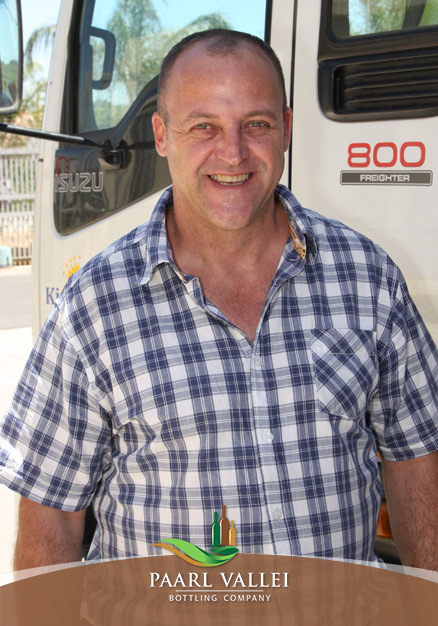 My interest in logistics was established while doing my National Service in the South African Army. My life philosophy: A journey of a thousand miles must begin with a single step. Everything in life has its own challenges. Descendant from the first French Huguenots that landed in the Cape of Good Hope. My family has been wine farmers in the wine industry for generations. I was born and raised locally, grew up on the farm Uitkyk and attended Hugenote Primary & High School in Wellington. I qualified myself as a teacher at OKB doing my H.Ed. Later I completed my postgraduate studies in Educational Management & Leadership. After a decade in education, including a few years abroad, my wife, kids and I decided to return to SA where I accepted a position at Imbuko Wines. With the wine industry in my blood, this community at my roots and managing my proficiency, I was proud to be part of a startup bottling company and seeing it flourish. I cherish my faith, family, honesty and loyalty above all, but challenge, growth & knowledge are the elements that fuel my ambition. I was thus fortunate to have secured a position at Paarl Valley Bottling as the Bottling Manager in 2015. This established and ever growing company, with its knowledgeable staff and outstanding leadership, provided the environment I was pursuing and the home I was looking for. I was born in Krugersdorp and matriculated at Stellenbosch High. I completed a Diploma in Mechanical engineering. I have been trained in SAP and Oracle Systems development, as well as Steel Manufacturing. I worked in the steel industry for nine years before my career made an unplanned U-turn towards the wine, spirits and juice industry as Store and Logistics Manager. 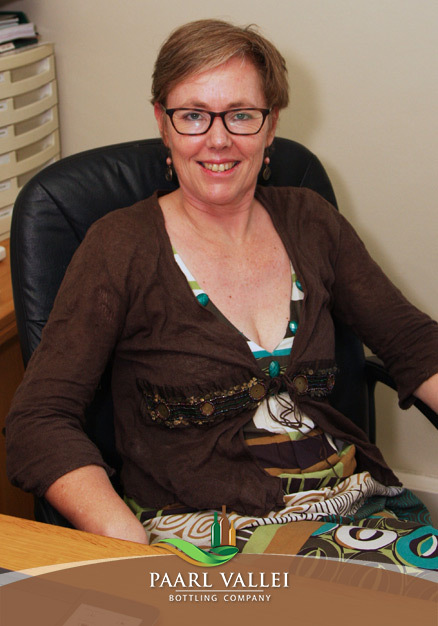 I have been employed at Paarl Valley since May 2015 as Store and Dispatch Manager. Although not planned I enjoyed the change in career path, as all the family on my father’s side made indelible steps in the wine industry. Design and development of products - PBM is a service provider and all customers are responsible for their own design and development of packaging within PBM capability to handle the packaging material. SQA where it is the responsibility of the client to ensure compliance to specification and food safety - Packaging or raw materials used for processing are selected and provided by the client. Selection of suppliers used by PBM's clients is outside the direct control of PBM. Materials provided by the client constitute customer property and are controlled by PBM to prevent their damage or deterioration while it is on our premises.